1 Year Old Male, Major Barking Problem!! We have a lovelly 1 year old boy pup and he has a really bad habit of barking. He huffs and grunts and then barks at every single little noise, even if next door sneeze! We live in a flat so there are a lot of people coming and going so this is a big problem. We have tried shaking a bottle with coins in at him when he barks, we've tried a water spray bottle and we even send him to bed when he does it and close the stair gate on 'his room'. We are very consistent and he gets plenty walks each day to male up for not having a garden. We've tried everything now and it's driving us a bit mad and we've had lots of complaints. He is apparently even worse when we leave him alone. Re: 1 Year Old Male, Major Barking Problem!! unfortunately barking at unfamiliar noises or is very common for Chows. It is part of their protective behavior. 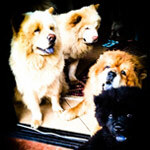 I have three Chows and they're taking turns in warning me about all the potential threats out there. Even worse they're warning the potential intruder that they're on guard. Whats working best for me is to calmly acknowledge that I got the message and that I'm in charge to protect the pack. So I go and face the "danger" and send them away. If they're quiet ,I have them checkout the situation as much as possible,so they understand that certain noises are normal. For this purpose, I let them go near the source of the noise or at least have them overview the area in question. If they bark again, I send them away again. In this way I got rid of the barking when the neighbor arrives home. when post or other items are delivered. I don't think anything like water spraying will work. I also only send them away if they bark at visitors or if they demand attention. I just saw the first time from this website.